It is possible to download a Pix4D project that has been previously uploaded for processing on Pix4D Cloud. Important: When downloading a project from Pix4D Cloud οnly the images and the .p4d file are downloaded. The project can be opened in Pix4D Desktop and should be processed locally. To download the results folder from Pix4D Cloud and to import it in Pix4D Desktop follow the step by step instructions: How to download results from the cloud. Note: This option is enabled when the software is opened and disabled once a project is loaded or created. 3. In the Pix4D mapper window Enter your password. 5. The list of projects that have been uploaded appear under Name. Select a project. 6. (optional) Click Browse... to change the path where the project will be stored. 8. 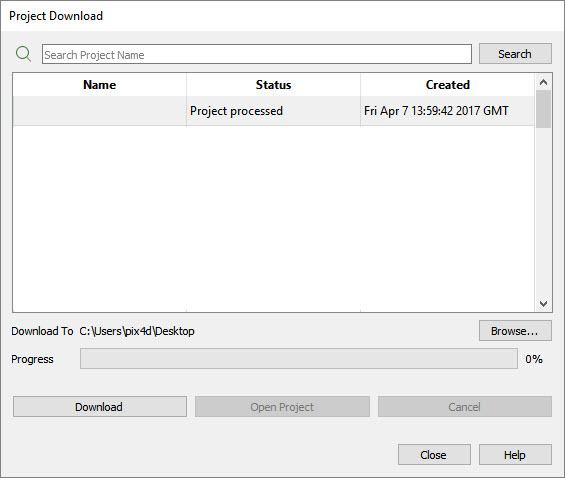 Click Open Project to open the project or Close to close the window, as soon as the project is downloaded. 9. Browse to the path where the project is stored at any time to open the .p4d file.